There are few books that will petrify you. That will evoke fear in you. That will make you jump at the slightest sound as you turn the pages. That will perhaps also have the strange effect of wanting-to-finish-the-book-no-matter-how-huge on you. I always thought that reading a book could not scare me. 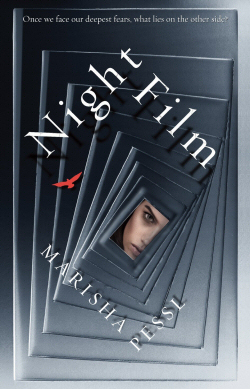 I was probably right; till I picked up, “Night Film” by Marisha Pessl and now I am a believer. I read Pessl’s earlier work (a debut), called, “Special Topics in Calamity Physics” and I must say that her style and plot narrative is nothing like that in “Night Film”. It is completely different, so much so that you would not believe that the same writer has written these books. “Night Film” had me sleepless for almost a week after I finished it and here I am recommending it to every single person, mainly because of the way it is written. So here is the plot: Ashley Cordova, daughter of the cult filmmaker Stanislas Cordova is found dead in an abandoned warehouse in lower Manhattan. Her death is ruled out as suicide. Ashley was a child genius who wooed the piano with her skills. Stanislas was last seen in public thirty years ago. He lives or is known to live in The Peak – his plush mansion away from civilization. Stanislas is legendary for his horror movies – to reveal the dark side of humans. His films are unsettling and there is always death of his family members – as associated with him. Enter Scott McGrath, an investigative journalist who thinks that Ashley did not commit suicide. He has been on the trail of Cordova since years, where one unfortunate incident made him lose everything that he ever had. He wants to know the truth behind the Cordova family. What are the movies all about? Are they real? Are they fictitious? What is about them that drive people insane to worship Cordova? What happened to Ashley? Why did she fall down to her death? What were the reasons? McGrath is out to find out the truth with the help of two strangers and this is hardly where the story begins. The book is true to itself. It does not talk of darkness and light. There is no bad guy; neither there is the good guy. Things are not as easy as they seem. The dark self and the so called self in the light could probably have a very thin line separating them, which we might never know. That’s what the book is about. I finished Night Film in about a day and a half. While it could be categorized in the horror or suspense genre, it is for sure more than that. Every chapter almost opens another layer, and another and one more and doesn’t let up till you have reached the end, which in itself is another layer. The book is full of graphics as well – from newspaper articles to interviews to internet links, which only add to the entire eerie effect. The writing is a breeze. It is perhaps even way better than her first book. “Night Film” is a book that deserves to be read keeping the phone aside, the computer switched off, no one to disturb you and the sounds of the night to accompany you for sure. Read it over the weekend and yes, get spooked. I cannot recommend it enough. This entry was posted in Books, Horror, Hutchinson Books, Literary Fiction, Random House UK, Review and tagged horror, Hutchinson Books, literary fiction, Marisha Pessl, Night Film, Random House UK, suspense on October 15, 2013 by thehungryreader.